As Andrew said, “it is amazing how much the author just throws the reader into the world of the missionaries, without much explaining.” But it’s not just things like mentioning companionship study or curfews. Take the simple matter of naming. The bulk of the novel is, roughly, from post-mission Mike Schwartz’s p-o-v. But when referring to himself or his companion, he doesn’t use first names or last names-only as many nationally-aimed missionary novels do. No, it’s always Elder Schwartz and Elder Toronto. I know this is hard for nonLDS readers to believe but it’s true: nineteen-year-old boys think of each other and refer to each other—and themselves!—as Elder. It’s not impossible to live together yet never know the other guy’s given name. But when he comes home? He’s Mike Schwartz again. Elder Schwartz now exists only as a memory. He is gone. And Mike Schwartz is reincarnated in his place. Autobiographical aside: The discomfort with my own name upon my return from the mission is origin of my Thmazing and Theric identities. I wasn’t who I was at eighteen anymore and I wasn’t allowed to be who I’d been two months earlier. So who was I? Most stories from national publishers that star missionaries don’t taste like missionary stories to former missionaries because they try too hard to let in outsiders by, for instance, giving the characters false names. But I’ve gone on and on about this before. If you have ever heard a story before, it will not surprise you to learn that the Argentine turns out to be capable of astonishing violence and evil and eventually takes over all of Vila Barbosa (which may be a real place notwithstanding its, to an Anglophone’s ears, symbolic weight). At first, these occasional tales of the Argentine seem like a true history. 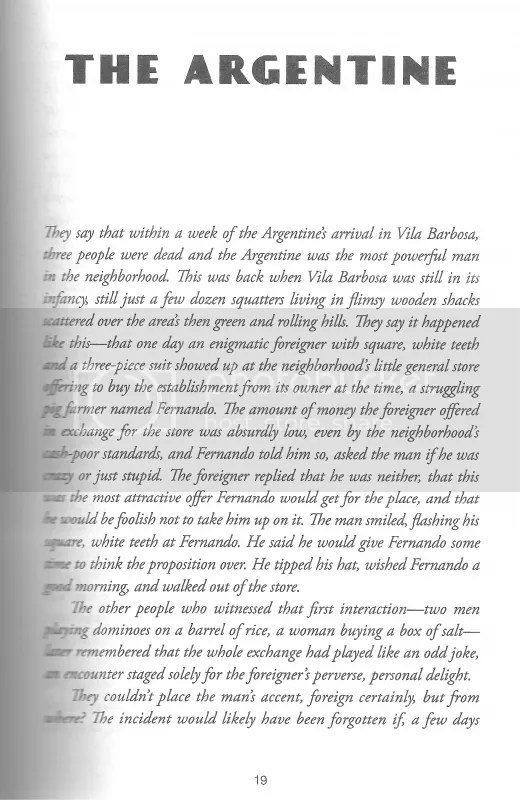 But they swiftly venture off into folklore and then into pure myth* as the Argentine turns Vila Barbosa into a physical manifestation of his own mind. I reached a point where I decided that if the Argentine ever had existed, the stories had long outstripped reality. Then events happened that seemed to confirm my opinion. They they twisted to make me unsure how right I was. Then I and the characters were forced to decide, when aligning our beliefs between the myth and the real, which do we prioritize? This is all complicated by the ongoing theme of the con. Several important characters in the novel are (or were) con artists, able to alter their marks’ understanding of reality long enough to relieve them of their wealth. So this Argentine fellow? Are these stories part of a con he’s pulling? When he protests their absurdity, does that make them true? If something’s not demonstrably factual, does that make it a con? If so, where does myth fit in? Holy crap these are difficult questions. I did not read the back of the book nor its flaps until the day after I finished the novel. (I have something of a tortured relationship with metatext. Don’t talk to me about anything on the back of Byuck.) And I’m glad I didn’t. Because this is a novel concerned with evolving understandings of The True, and the back of the book is a snapshot of one version—and thus exalts that version—of The True. For instance, its description of Marco Aurélio’s brother. We don’t learn he exists until, gosh, half the text has passed? And the version of him as described on the back of the book barely survived the chapter! Some of the descriptions of the novel I’ve read online present versions of The Truth out of the order they were uncovered, making the second half of a sentence being untrue according the the values established by its first half. In brief: read them if you want, but don’t use them as a roadmap. Since part one of the novel is presumably Mike Schwatrz’s thoughts during “the not-infrequent nights that he had trouble sleeping . . . nursing a glass of warm milk and composing . . . lists . . . of factors that had stood in their way” of preventing* Marco Aurélio’s disappearance (9, but the first page), it’s natural that his thoughts should slip forward and backward in time. It’s not as chaotic as, say, Slaughterhouse-Five, but like Slaughterhouse-Five, the primary plot only proceeds forward, while tangents and off-timeline events come and go. The first time this happened, I was irritated. Largely because it was part of the primary plot that had just been skipped over. Beginning of the fourth chapter and we’re already heading back to the space between chapters one and two? Come on! But that particular sort of looking backward was not repeated. All other examples are other character’s stories, usually (including, in fact, the one I was just complaining about) their relationship with Marco Aurélio. And each provides more facts. And more facts only cloud our certainty of the facts we already knew. Elder Toronto is alive with the need to solve Marco Aurélio’s mysterious disappearance. But why? Is it an innate part of his personality? Is his sublimation of his family’s death being expressed through a search for meaning here? Is it a matter of a worldview he’s been evolving since childhood? Now, mystery of course is a word with religious application. In some Mormon circles we might call these shelf items, the idea being that mysteries are dangerous and should be left alone. Publishers Weekly says of this novel that “Unanswered questions hang wickedly in the air”—as if unanswered questions are wicked. Marco Aurélio refused to leave his previous life of wickedness and agree to baptism until he had an answer that settled the mystery, for him, of the Church’s trueness. So are answers good and the unaswerable wicked? When Booklist says, “Wirkus’ twisted tale . . . is an absorbing mental exercise that’s opaque enough for the most jaded armchair detectives and is guaranteed to spark delicious book-group debates,” it seems to suggest that a lack of answers at least has a positive aspect as entertainment. The two main characters, the missionaries, form a pair almost like Sherlock Holmes and John Watson, the main character being a slightly dull Watson dragged along by his energetic and condescending senior companion. And yet it’s much sadder than any story by Sir Arthur Conan Doyle. The climax is surprising and shocking, but the conclusion, not to give too much away, left me feeling quite unsettled and more than a little depressed. But that’s what good literature does, it makes one think and question and leave thinking things he or she hadn’t thought much about before, even if those thoughts aren’t always sunny. This is the kind of accomplishment Mormon literature should strive for. We don’t need to be told everything is wonderful for those who follow the Lord. We need to see life, and ourselves, as the imperfect creations we are, so that we can answer those difficult questions posed so clearly by this extremely well-written story. To be honest, this is not the tone I would have predicted from the strident atheists over on Main Street (though I haven’t followed the site for years—who knows how they’ve evolved)* and I certainly agree with them. An unanswered question represents life as lived better than the more aspirational answered-question. Both are valid in fiction, of course, but I’m not convinced the latter is necessarily more true. This is when Part Two begins. It’s thirtyish years later and our heroes bump into each other again in an Arizona supermarket. We haven’t seen them since the sudden interruption of their missions. Mike Schwartz is the same person only married with kids. John Toronto is the same person only, it seems, without place to return to at night. This is a hint as to why Main Street Plaza found the story’s conclusion unsettling and depressive, but only a hint. The real reason the story might unsettle or depress is the emotions these once companions feel toward each other after they discover how each feels today about the mysterious disappearance of Marco Aurélio all those years ago. How do we measure growth? Where do we measure satisfaction? When should we prioritize change? Are there right answers to those questions? As in terrific novels like City of Glass or The Colorado Kid or Mr White’s Confession, the mystery in City of Brick and Shadow is never resolved. Although I suppose if this were true of every mystery I might not find a lack of resolution so satisfying, I do find that most mysteries aren’t really about the mystery at all. They are about the solution. They are solution stories. The true mystery story (as defined here by me) has no solution. The weighty question in the final pages is whether or not Elder/John Toronto knows this. Has he learned to appreciate mystery? or is he still in earnest search of a solution? I propose the well-lived life (including the well-lived religious life) fits least comfortably and most appropriately somewhere inbetween. This review is based on a gratis copy from the publisher. Other posts on this novel may be accessed via this link. I don’t think it’s fair, or necessary, to pit Harrison and Wirkus against each other for any reason. We have room for many types of books, written by many types of writers, for many types of readers. That being said, I had looked forward most to Harrison’s book last year, and found myself disappointed, but was surprised by how much I loved Wirkus’ writing. I also found it interesting that I related much more to a book about Mormon elders in Brazil than a book about a Mormon woman in Utah, seeing as how I’m a very typical Mormon woman who lives in Utah with her family. A side note on names–I agree with you on the conventions within the mission. In my head, I refer to all my former companions as “Hermana —-” still, even though most of them have married and changed last names. As for the book, I really loved it. I’m not an expert on Latin American literature, but I’ve read a lot of it and I thought this book really captured the feel of 20th century Latin American novels, like those of Borges, Julio Cortazar, and Ernesto Sabato. There is also a great love for film noir in Latin America and Spain, both in film and literature, and I felt that influence in this novel as well. I’ve recommended it to a few friends who actually are professors of Spanish lit and I hope they read it and tell me what they think. Interesting. Other than a few short stories and poems, I really don’t know 20th-c Latin American lit (to my shame) so that’s a welcome observation. I am about 2/3 through the book, and I love it too. What a great character Elder Toronto is, I remember “difficult” missionaries somewhat like him, but I don’t think I have ever read a character like him in a Mormon novel. And the mythic nature of the Argentine is just becoming apparent in the part I am reading, which is a fascinating turn. The Main Street Plaza review is by Johnny Townsend (there is another version an Amazon, http://www.amazon.com/City-Of-Brick-And-Shadow/dp/1440582769). I like how he compared the companionship to Holmes and Watson. Toronto definitely is a Holmes figure. Also, in the Amazon reviews, Jon Ogden says, “The scene with the parrot will haunt me for years.” I agree. I just finished this novel, and I thought it was fantastic–even though I generally hate missionary novels. I think part of why this one works so well, aside from what you’ve already pointed out in the review, is because it doesn’t read like one long, boring mission story. Missionary work and lifestyle are crucial elements in the novel, but they really function more to enable or complicate certain developments in the plot rather than monopolize them. The Mormon novel I kept comparing it to was Angel of the Danube–mainly for the way myth and the recounting of myth plays an important role in both novels. I think it’s also interesting that both are structured similarly. Possibly this novel is the love child of Angel and Millstone. What it isn’t, fortunately, is another Elders–which is what I worried it would be. For one, I think it better captures how tensions between companions really play out than all of the sensationalist stuff we see in Elders. Elders maybe gives a better idea of the monotony of missionary work, but it’s so by the book as far as missionary novels/post-Mormon novels/mainstream literary novels go. Having served in Brazil, I think City, Elders, and Millstone all do a good job of capturing the feel of the country–but I like how this novel captured a bit of its mystical draw without exoticizing the place. (I’ve never believed in a dark, unseen world more than when I served in Brazil. But maybe that just comes with the missionary experience.) Anyway, I think Jessie said it best above when she compared it to 20th Century Latin American lit. I haven’t read much of it either, but what I have read seems echoed in City. I’m making it a point to read the Borges stories Wirkus cites in his acknowledgement section. Which brings me to the Argentine. I was annoyed at first with the intrusion of his story, but after a while it became one of my favorite parts of the novel. Also, this is the first Mormon novel I’ve read in a long time that I’ve wanted to recommend to everyone. Wow. It must be getting some traction because my library system picked up 5 copies of it. Sadly, all are currently checked in at the moment, but still. I really enjoyed it. I don’t love ambiguous endings, but I still liked the book overall. Sherlock meets Borges meets the Mormons, and very well done on many levels. You must be from Bloomington! Best I know, I love everyone in that town.